Nottingham Teaching Associate Philip Davies and PhD student Peter Davies (no relation) report on the second of two Sparta panels at the recent CA conference. See here for their first report. The second of the two panels on Sparta at the recent Nottingham CA conference expanded our focus beyond the citizen body of Sparta, considering ‘Sparta beyond the Spartiatai’. Carlos Villafane (PhD student, Liverpool) spoke about the evidence which grave inscriptions for those killed en polemoi (in war) provide for the relationships between the Spartans and their dependent neighbours, the perioikoi. Carlos observed that, perhaps surprisingly, the honour of such a gravestone was available to perioikoi, just as to Spartiates. 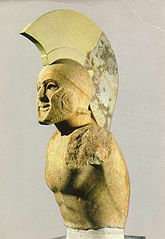 He argued that this demonstrated considerable ideological equality between the two groups: the Spartans allowed the perioikoi equal honour in death because they honoured them equally in life. Peter Davies came to rather different conclusions in considering ‘Social Dissonance in Lakedaimon’. Exploiting models developed by sociologists Bourdieu and Hope, Peter argued that Spartans could not accept social mobility into their citizen group due to an extreme awareness of status and social origins: to a Spartiate, no ‘lesser’ resident (including perioikoi) could ever truly become equal to a full citizen. He suggested that this intractability could account for Sparta’s failure to tackle the oliganthropia – decline in citizen numbers – which progressively weakened it over the course of the classical period. Lastly, Jennifer Martinez, (PhD student, Liverpool), presented a paper ‘Reassessing the Behaviour of Spartan Women during the Theban Invasion of Lakedaimon’. Regarding this episode, hostile sources present Sparta’s women as useless, and even actively harmful in the face of war. Jennifer led us through an insightful exploration of the diverse, sometimes conflicting evidence from across the classical Greek world for women at war, to illuminate from where those negative sentiments arose. The contributors to the two CSPS panels thoroughly enjoyed the CA conference. It was rewarding to see how scholars are building upon the influential model of Sparta propounded by Hodkinson and Powell. It was also interesting to see how this model, now the effective orthodoxy among Spartanists, still meets with some scepticism among classicists more generally, and to observe these two viewpoints interacting in discussion of the papers.